Before answering the question of whether we can trust health advice we must first ask: ‘Which health advice?’ It varies so much over time and between countries. In 1979, the government advised men to drink no more than 56 units of alcohol a week. This was later reduced to 36 units, then 28 units and then 21 units. Last month, the Chief Medical Officer reduced it once again, this time to 14 units. According to the current UK official guidelines a unit of alcohol equals 10 ml or 8 grams of pure alcohol (ethanol). If the definition of an alcohol unit has not changed (Christopher Snowdon doesn't state this explicitly but it is heavily implied – otherwise the comparison wouldn't make sense at all) this would mean: In 1979 a man drinking an astonishing amount of e.g. two bottles Bacardi rum (700 ml with 37.5% alcohol by volume) every week would (with 53 units) still not exceed the guidelines. Now, of course, I wouldn't be surprised if the guidelines were much more lax back than. But I have doubts that it was that extreme. So is it true that (for men) in 1979 the official UK recommended alcohol limit was four times as high as the current one? I tried to follow the trail, but was unsuccessful. In 1979 a special committee of the Royal College of Psychiatrists stated that the absolute upper weekly limit was about 56 units of alcohol. Now, that is not quite the same as "the government advised men to drink no more than 56 units of alcohol a week", but it seems very likely we are talking about the same source. I haven't found an online version of the 1979 book (although it is available in libraries) The book is available on Google Books, which allows you to view snippets of scanned sections, but my repeated attempts to search for the appropriate recommendation failed. In 1981, the UK Health Departments published the booklet Drinking Sensibly, which provided a definition of alcohol misuse and introduced the concept of sensible drinking. It was not until 1984 that guidance on individual drinking was produced, in a pamphlet That’s the Limit, published by the then Health Education Council. The pamphlet gave “safe limits” for drinking, defined as 18 “standard drinks” a week for men and 9 for women. One standard drink was equivalent to one alcohol unit—a concept that would be introduced in the next edition. The pamphlet also defined “too much” alcohol as 56 standard drinks a week for men and 35 for women. I conclude that it is likely that the Royal College of Psychiatrists made some statement about 56 units of alcohol, but that's not the same as an official recommendation to its citizens. Actual recommendations didn't appear until 1984, and they did not condone the drinking of 56 units of alcohol. No. But for the simple reason that the UK in 1979 did not have a country wide guideline. Yes, in the sense that in 1979 one such guideline was proposed. From that starting point the trend for a constant lowering of these values was to be observed. Most strikingly, individual benefit for any of these guidelines seem to have been a target value of near zero over the course of the efforts evolutions. Instead choosing 'a trickle down effect will come' for this approach as well. The final stage of the HEC’s anti-alcohol campaign in the north east was framed around a desire to promote ‘moderate drinking’. Those involved in devising the campaign wanted it to focus on heightening awareness of alcohol problems rather than cutting the consumption of alcohol per se. The HEC dropped Saatchi and Saatchi, and instead made use of a Newcastle-based advertising agency, Redlands. 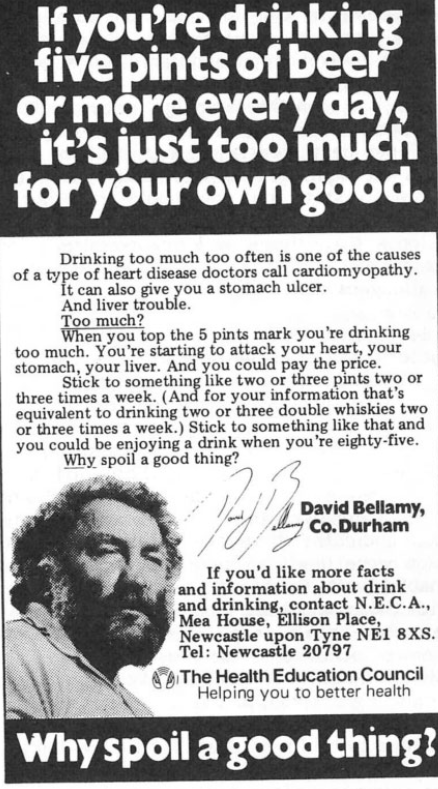 The agency devised new campaign materials featuring local TV presenter and botanist, David Bellamy. Bellamy was chosen by Redlands because they felt that he would be seen by the public as intelligent and honest, but also able to connect with the intended audience as he was from the north east and a drinker himself. The advertisements offered guidance on how much alcohol was ‘too much’ (five pints of beer or more) and also suggested a level of moderate consumption as being ‘something like two or three pints two or three times a week’ (Figure 4). Indeed, the benefits of moderate alcohol consumption were tacitly acknowledged by the campaign’s tagline ‘Why spoil a good thing?’. The setting of drinking limits was, however, controversial. There was little agreement amongst experts about what a ‘safe’ level of drinking consisted of. In their 1979 report, the Royal College of Psychiatrists suggested that four pints, four double whiskies or one bottle of wine a day ‘constitute reasonable guidelines of the upper limit of drinking’. Yet, other experts were concerned that setting an upper limit would encourage people to drink up to that level in the belief that their behaviour could do no harm. Taken together, the three phases of the HEC’s alcohol education campaign in the north east points to an evolution in targets, techniques and tactics. In the first phase of the campaign, the target group seemed to be alcoholics, or the ‘drunk’. In the second phase, the target group was the ‘boozer’ or the ‘heavy drinker’. In the final phase, it appeared that a wider drinking public was the target, with the desire to promote ‘sensible’ or ‘moderate’ drinking. The techniques also altered over time, with humour and emotional entreaties giving way to a more ‘rational’ approach, appealing to the drinker as a ‘sensible’ individual able to moderate their behaviour. Such changing techniques spoke also to changing tactics, with a more specific sense of the kinds of behaviour that should be encouraged or discouraged emerging by the end of the period. These shifts reflected broader developments at the policy level that will be explored in the remainder of the article, but at the same time there was also a lack of confidence about health education itself. Significant doubts were expressed, not least by the HEC, about the ability of health education to shrink alcohol consumption. Other means, such as reducing drinking at the population level, seemed to offer an alternative solution. On a practical level, a more specific notion of what sensible drinking consisted of in terms of the amount of alcohol consumed began to develop in the latter half of the 1980s. Suggested daily limits had already been proposed by the Royal College of Psychiatrists, but in 1984 the HEC issued a pamphlet setting out the ‘safe limits’, to which people should restrict their drinking. ‘Safe limits’ for drinking were defined as 18 ‘standard drinks’ (equivalent to half a pint of beer, a small glass of wine or a single measure of spirits) a week for men and nine for women. In 1986 and 1987 the Royal College of Psychiatrists, the Royal College of Physicians and the Royal College of General Practitioners each published reports on alcohol, and all made the same recommendations with regards to consumption limits. The reports suggested that ‘sensible limits of drinking’ consisted of not more than 21 ‘units’ of alcohol a week for men, and not more than 14 units a week for women. A unit of alcohol was equal to 10ml or 8g of pure alcohol, or about half a pint of beer. In January 2016, the recommended weekly limit to alcohol consumption for men (previously 21 units) was brought into line with that of women (14 units). It is also important to note that sensible drinking has a distinct and somewhat well-documented history (Ball 2003; Ball et al 2007). Sensible drinking has its conceptual origins in the belief in ‘controlled drinking’ as an alternative harm reduction strategy for dependent drinkers in the 1950s and 60s (Banerjee et al 2006). The belief that controlled drinking was possible reflects a profound split among addiction experts between those advocating abstinence as the only route to recovery for alcoholics and those suggesting that alcoholics could return to drinking only in a controlled, tightly supervised manner. By the 1970s and 1980s, epidemiological studies were pointing to the possible protective health effects of ‘moderate’ alcohol consumption; an idea that would later play a significant role in the aspiration for a café culture characterised by ‘moderate drinking’. Ball (2003) suggests that the most recent history of ‘sensible drinking’ guidelines in the UK can be traced to the 1979 Royal College of Psychiatrists’ report Alcohol and Alcoholism, which set safe drinking limits at an exceptionally generous 8 units a day (56 units a week). However, by 1981 the then Department of Health and Social Security in its discussion paper ‘Prevention and health: drinking sensibly’ shied away from giving information about drinking limits, fearing that this might, inadvertently, constitute too permissive a stance towards drinking. Instead, as Ball et al (2007) highlight, the report suggested that Britons should drink in moderation and in a fashion appropriate to circumstances, but that ultimate responsibility for this was firmly in the hands of the individual. 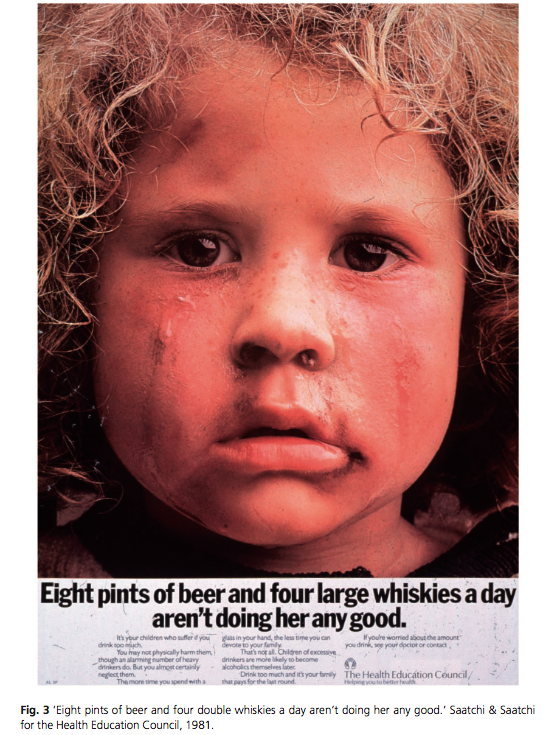 In 1984, the Health Education Council published a pamphlet in which it set a recommended limit of 2 or 3 pints, two or three times a week for men and two or three standard drinks two to three times a week for women. This would equate to 8–18 units a week for men and 4–9 units per week for women. Adding to the confusion, the Royal College of Psychiatrists issued advice in 1986 stating that alcohol-related harm increased greatly above 50 units per week for men and 35 for women, but cautioned the need for common sense in the interpretation of these limits. By the time of a 1987 Health Education Authority booklet, the government had agreed to the 21/14 units a week message and in 1992, the Health of the Nation report used these limits to set the target to reduce the proportion of men exceeding them from 28% in 1990 to 18% by 2005, and the proportion of women exceeding them from 11% in 1990 to 7% by 2005. In 1995, as concern with the UK’s emergent ‘lager lout’ culture and the first wave of mass panic over alcopops took hold, the government commissioned a review of its sensible drinking guidelines. The review ‘concluded that it was more appropriate to set benchmarks for daily than for weekly consumption of alcohol, partly because of concern about the health and social risks associated with single episodes of intoxication’ (Department of Health 1995; Goddard 2007: 4). The report stated that ‘regular consumption of between three and four units a day for men and two to three units a day for women does not carry a significant health risk, but that consistently drinking above these levels is not advised’ (Office of National Statistics 2007: 4). Such advice about regular drinking was also motivated by new research suggesting that ‘moderate’ levels of alcohol consumption might reduce the risk of coronary heart disease (CHD) through its effect on lipids and homeostatic factors (Rimm et al 1999). Such research stemmed, in large part, from curiosity over what has become popularly known as the ‘French Paradox’ or the coexistence of low rates of CHD and high levels of red wine, red meat and fat consumption in France (Renaud and de Lorgeril 1992). The suggestion of alcohol’s ‘protective effect’ is still subject to a debate of varying degrees of intensity, for reasons that leap beyond the biomedical and squarely into the realm of political economy, national protectionism and populist policy making. However, research into the relationship between wine consumption and CHD rates in France do reinforce the assertion that there is a fundamental difference between the health effects of ‘moderate’ wine drinking and more irregular episodes of heavy sessional beer and spirits consumption (Ferrières 2004). These studies also raise the question of the causal role of other confounding lifestyle choices such as stress, physical activity, smoking and diet, as well as the role of the environment and context within which drinking takes place. Yet, it is important to note that research into the French Paradox has also had the effect of conferring a certain legitimacy and prestige to wine drinking, marking it out as potentially good for you and therefore somehow an inherently different category of alcoholic drink within the orbit of sensible behaviour. The distinction of wine drinking will consequently be revisited in Chapter Eight as it illustrates the ways in which class, taste and socioeconomic difference overlap in the creation of the alcohol control debate and its associated judgement of the boundaries of responsibility. Building from this interest in the relative safety of Southern European drinking styles, shifts in the delineation of both risk and sensible behaviour were underpinned by a fear that maximum weekly ‘limits’ offered up the temptation of consuming them in their entirety on a single drinking occasion, thus sanctioning risky binge-drinking practices. This also dovetailed with a turn in both epidemiological and political thinking to the risks attached to specific drinking patterns and, as Gill and O’May highlight, ways ‘to help people avoid drunkenness’ (2006: 303). Despite this, it is interesting that the review’s claim that there is ‘no significant health risk’ of drinking up to the daily limit (of 2/3 or 3/4 units for women and men respectively) in effect condones weekly consumption of 28 units a week for men and 21 for women. Furthermore, given that the new advice rested heavily on the shaky and contentious science of the relationship between alcohol and CHD risk in older age (Edwards 1996: 1), additional advice was given to older people (who abstain or rarely drink) that they ‘may wish to consider the possibility that light drinking may benefit their health’ (Ibid). The 1995 report also turned away from the language of safe drinking ‘limits’, drawing instead on the far more malleable term ‘benchmarks’. This subtle semantic shift signalled some degree of flexibility and uncertainty in official advice and, as Ball (2003) asserts, garnered intense opposition in the biomedical and public health community and was quickly condemned by the British Medical Association in its 1995 report Alcohol: Guidelines on Sensible Drinking. As a result, the daily and weekly unit recommendations were kept with the caveat that drinkers should ensure at least two drink-free days a week. However, sensible drinking has not been without controversy, and a history of ‘conflicting advice on sensible drinking in Britain has left confusion in its wake’ (Ball et al 2007: 100). As a result, it has also irrecoverably dented public trust in the reliability of sensible drinking guidelines. This dent still shapes public ambivalence towards drinking and reinforces the complexity of the public health task, especially given the residual belief that there is poor understanding of both alcohol units and how these relate to personal acute and chronic health risks through the drinking limits. As Ball et al contend, ‘the sensible drinking message is confused and poorly understood … [it] is not an effective approach to reduce excessive alcohol consumption and this needs to be addressed urgently’ (2007: 101). Clare Herrick: "GoverninG health and consumption Sensible citizens, behaviour and the city", (p156–158), Policy Press: Bristol, 2011. Not the answer you're looking for? Browse other questions tagged alcohol public-health .